In spite of Father Peyton's passion and the extraordinary energy which he expended in traveling, speaking, organizing and planning for the growth and expansion of his ministry in the 1990's, his health began to fail. Father Peyton celebrating Mass in Attymas, Ireland. Mary, my Queen, my Mother. 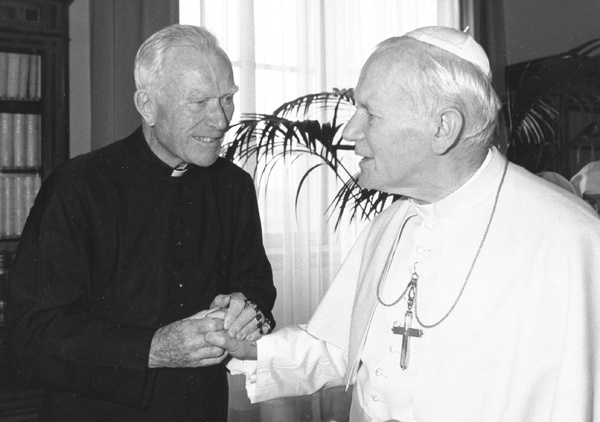 Father Peyton, left, with Rosary in hand, greeting Pope John Paul II in 1980. Father Pat was unique, he was charismatic, he was seemingly tireless, and in his lifetime, he did more to inspire devotion to Our Lady and the Rosary than anyone in history. Father Peyton's simple gravestone in the Holy Cross Community Cemetery, North Easton, MA. 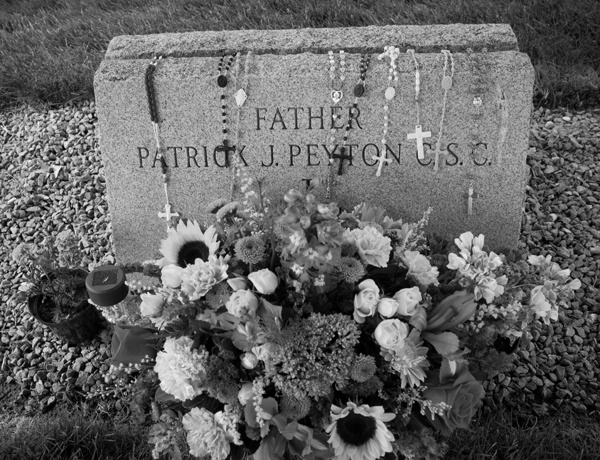 Father Peyton was buried on June 8, 1992 in Holy Cross Community Cemetery at Stonehill College in North Easton, Massachusetts. 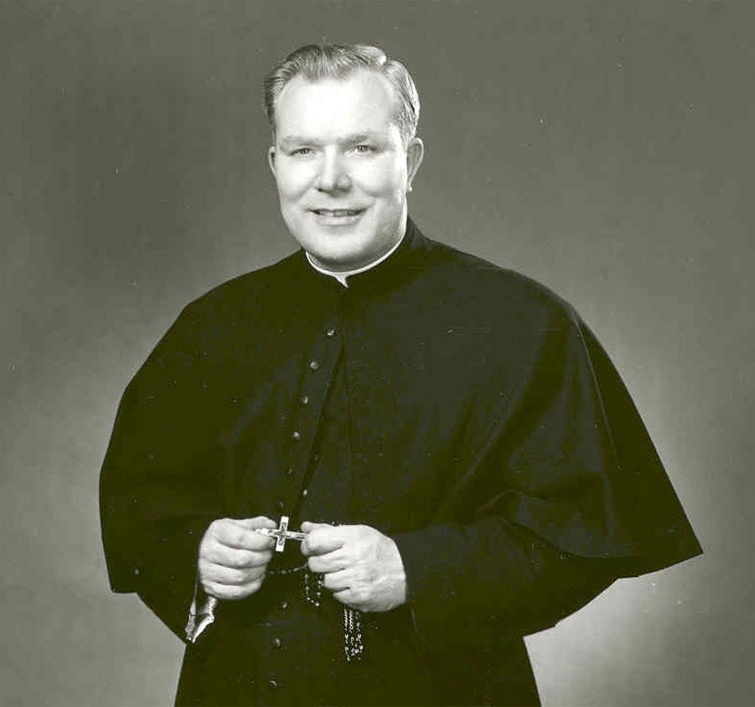 While he lived, Father Peyton’s prayers and healing touch assisted many in their needs, since his death, many reports of favors received through his intercession have been noted. Some report physical healings, others tell of spiritual favors received, of special mention are reports of alienated Catholics returning to the sacraments and of families finding hope and courage in suffering. Many commented on how quickly their prayers were answered. Father Peyton was never without a Rosary. 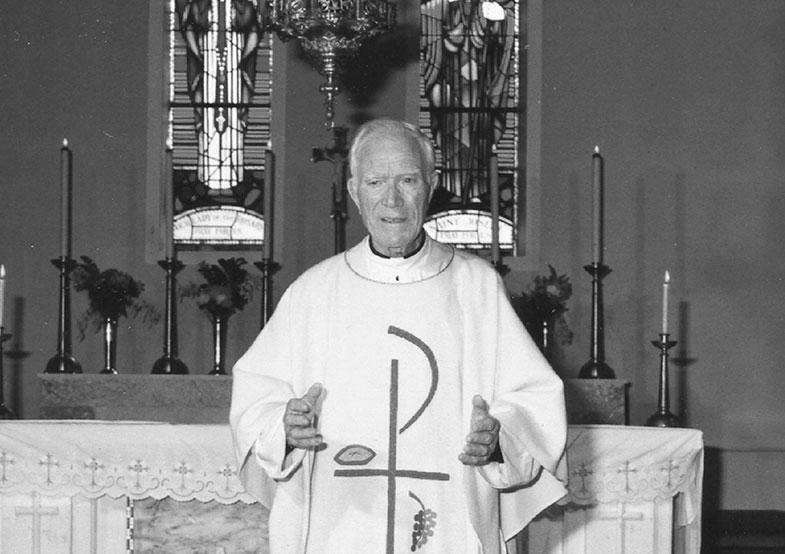 At the request of the Congregation of Holy Cross, the religious community to which Father Peyton belonged, the Bishop of Fall River, Massachusetts, with the approval of the Vatican, officially opened the Cause of Canonization on June 1, 2001. At that time, Father Peyton was given the title Servant of God. Since then, significant work has been completed to present Father Peyton's heroic practice of virtue and reputation for holiness. Once declared a servant of God an extensive process of documenting the person's life and work begins. For Father Peyton, over 150 people were interviewed in countries around the world. In addition, all of the public statements and published works and accounts about him were collected. Later the formal case for sainthood was presented in a summary called a Positio. A Vatican Committee called the Congregation for the Causes of Saints then examined the Positio. They determined Father Peyton lived a life of heroic virtue and sanctity of life and voted to send the cause to the Holy Father. ©2019. All Rights Reserved. Family Rosary.